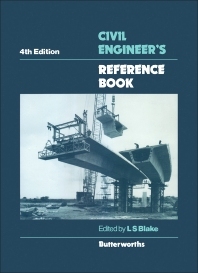 Civil Engineer's Reference Book, Fourth Edition provides civil engineers with reports on design and construction practices in the UK and overseas. It gives a concise presentation of theory and practice in the many branches of a civil engineer's profession and it enables them to study a subject in greater depth. The book discusses some improvements in earlier practices, for example in surveying, geotechnics, water management, project management, underwater working, and the control and use of materials. Other changes covered are from the evolving needs of clients for almost all forms of construction, maintenance and repair. Another major change is the introduction of new national and Euro-codes based on limit state design, covering most aspects of structural engineering. The fourth edition incorporates these advances and, at the same time, gives greater prominence to the special problems relating to work overseas, with differing client requirements and climatic conditions. Chapters 1 to 10 provide engineers, at all levels of development, with 'lecture notes' on the basic theories of civil engineering. Chapters 11 to 44 cover the practice of design and construction in many of the fields of civil engineering. Civil engineers, architects, lawyers, mechanical engineers, insurers, clients, and students of civil engineering will find benefit in the use of this text.